Work began on the site in 1903 after an aristocratic widow left today’s equivalent of over fourteen million pounds in her will to build a church somewhere in London. Tooting at that time was a small village about to become a large housing estate, and so seemed the perfect location for a new church. While the church was being built, services were held in a tent and then an iron chapel. During building work, a rift developed between John Stephens – the executor of the will who was to be the church’s first vicar – and the architect, Temple Moore; the former was buying furnishings for the church which the latter considered unsuitable for his vision. 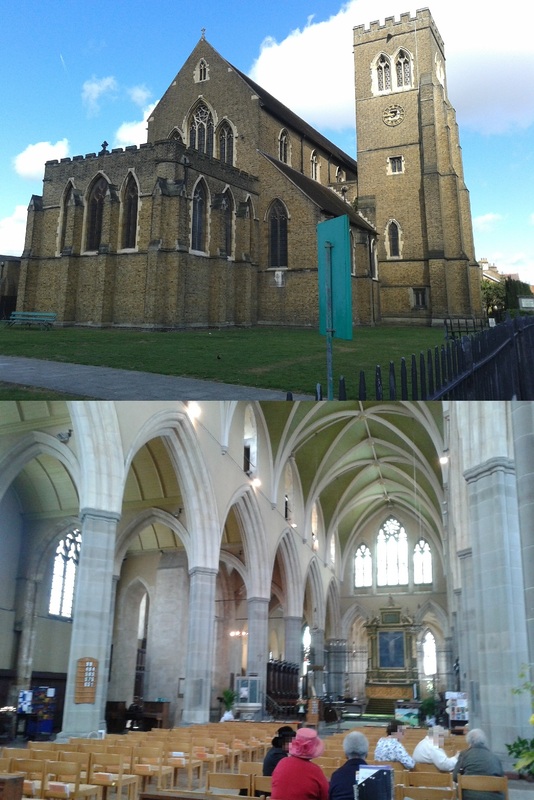 The church was consecrated on 7 July 1906 as one of the largest and most well-financed Anglican churches in south London. However, inflation resulted in what was left of the original sum of money – the interest from which was used to fund the parish – losing much of its value, and in the late 1950s much of the surrounding property owned by the church was sold off. An adjoining Parish Centre was opened by Princess Alexandra in 1983. Approaching from the outside, the church stands out from the surrounding houses due to its large size. The interior of the church is a mix of Italianate furniture and neo-Gothic columns and arches. Stations of the Cross are on the columns around the sides of the nave. One’s attention is drawn to the green and gold altar, above which is a Renaissance painting of the Crucifixion. Behind the altar is the Lady Chapel, and above it are stained glass windows depicting Christ in Majesty, the Virgin Mary and St John the Apostle. Other stained glass windows depict sainted or contemporary bishops relevant to the church and to the historical parish of Tooting, but most of the church’s windows have plain glass. At the back right of the church is a table from which refreshments were served afterwards, and notice boards next to that. Also on the back wall of the church are monuments to its first vicar and to the family that financed it. The service was led by two vicars, one female and one male, both in vestments. A choir of five in green choir dress led the hymns, and a male altar sever in a white carried a processional cross in the processions. The congregation numbered forty people, only eight of whom were men. The majority of the congregation (about two thirds) were black. Nearly all were middle-aged or older, but there were enough younger parents for a Sunday school. Statistics aside, most of the congregation were friendly and welcoming. One gentleman in particular spoke to me afterwards in detail about the history of the church after learning I was a visitor. Two ladies at the back handed out service sheets to those arriving (unfortunately they stayed at the back after the service started and continued chatting to each other – at a volume loud enough to be distracting for those, like me, sitting near the back – until after the Sunday school had been led out!). I attended the 10am Sunday morning communion service. It followed the standard order of service for a Church of England eucharist, and was followed from laminated sheets found in the back of the chairs. The service began with a procession, during which a hymn was sung; four other hymns were sung during the service, with the words found in hymn books also in the back of the chairs. The Bible readings were Acts 7:55-60 and John 14:1-14. The female vicar gave the sermon, reflecting on how asking for something “in Jesus’ name” goes beyond invoking His name and involves aligning oneself with His will and example. After the sermon came the prayers leading up to communion, including the Nicene Creed and the Lord’s Prayer. Communion – which most, but not all, of the congregation went up to the high altar to receive – was taken by intinction, with the wafers being dipped in the wine before being received. After communion, notices were given and a final hymn sung. Furthermore, the Sunday school came into the church and showed the congregation what they had been doing. The service lasted roughly one hour and fifteen minutes. Tea, coffee, juice, cake and biscuits were available at a table at the back of the church after the service had ended. Several members of the congregation stayed in their seats for some time to chat after getting refreshments, and a few people approached me to welcome me to their church.